It was 7:30 in the evening on 26 October 2018. The day being a typical Friday, Sri Lankans had been settled for yet another uneventful weekend. Many had sat in front of TV sets watching their favourite teledramas. Suddenly, viewers got alerted by a news flash that started blinking on their TV screens. Later, when the full details were out, it was shocking news. It said that President Maithripala Sirisena had appointed his arch rival, former President Mahinda Rajapaksa, as Prime Minister sacking his partner in politics for four years, the sitting Prime Minister Ranil Wickremesinghe. This executive action which the President and his supporters maintained as an exercise of the discretionary powers which he has got under the constitution gave birth to a man-made constitutional crisis unprecedented in the history of the country. For 52 days, two people, Mahinda Rajapaksa and Ranil Wickremesinghe, claimed to be the Prime Minister of the country. It not only confused Sri Lankans but also the international community. All the major embassies and international organisations kept a watchful eye on the political and constitutional developments in the country. Both the International Monetary Fund and the US based Millennium Corporation even suspended two credit lines already approved for the country. Strangely, the new Prime Minister appointed by President Sirisena was congratulated only by one country – the unknown African nation called Burundi. China too which has a significant economic stake in Sri Lanka did not accept the new Prime Minister though its Ambassador to Sri Lanka had reportedly met Rajapaksa in his private residence. The bureaucrats who have to run the country on the direction of the political leadership too were confused since there were two governments. Though they sided with the President because he was the Executive President, it was done only as a call of duty. Thus, it was a period of chaos as well as suspense. Rajapaksa who had the backing of Sirisena went on to appointing a Cabinet of Ministers from the political group he had been leading called the Joint Opposition initially and later from the official Sri Lanka Freedom Party or SLFP. This was made possible because those who had held positions under Wickremesinghe had lost their posts when he was sacked. When some of them attempted to visit their ministries, they were manhandled by those who claimed to be the supporters of the Rajapaksa government. The new Cabinet, in order to bid the support of the public, made mid-night announcement of a series of reliefs which were not affordable, given the country’s perilous state of finances. But the public at large was aloof to the announcements since there was a feeling that they could be removed at any time. Meanwhile, Wickremesinghe got himself holed up in the Temple Trees, the official residence of the country’s Prime Minister, supported by his party men. The purpose was to continue the agitation against what his party termed as an unconstitutional decision by Sirisena and regain the lost premiership. It was a chaotic time marked by uncertainty about the future, on one side, and mistrust in everyone, on the other. The original battle was between Sirisena and Wickremesinghe. But it soon became a battle between Sirisena and the UNP side in Parliament. The UNP side was led by Speaker Karu Jayasuriya and therefore, it also became a battle between Sirisena and Jayasuriya. When the matter was taken up in courts, it soon became a battle between Sirisena and the judicial system. Finally, it was resolved by courts in favour of Wickremesinghe compelling Sirisena to re-swear him after 52 days as the Prime Minister despite his earlier pronouncements that he would not do so under any circumstance. 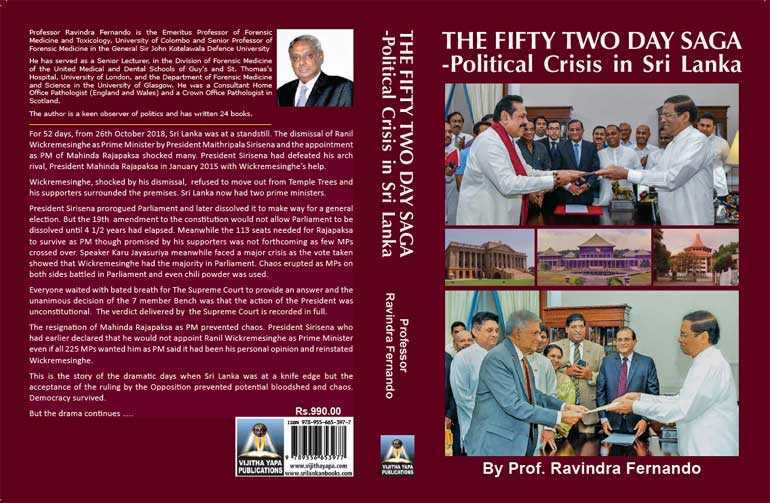 While this story is still hot news, a forensic expert – Emeritus Senior Professor Ravindra Fernando – has dissected the 52 day saga and incorporated his findings into a book titled ‘The Fifty Two Day Saga: Political Crisis in Sri Lanka’ just published by Vijitha Yapa Publications. This is the first authentic book on the so called saga. It is also the 25th book which Fernando has authored during his second career as a writer. The book contains 11 chapters covering the entire saga from the beginning to the end. It is a report providing facts as they are without taking a side. The analysis into the chain of events during the 52 day period by the author is limited. But it has reproduced all the source material such as the determination of the Supreme Court, press notices and press interviews given by the main contenders – Sirisena, Rajapaksa and Wickremesinghe – to enable any other researcher to come up with his own analysis. Chapter 1 is a long essay on the beginning of the political crisis that led to the sacking of Wickremesinghe and the appointment of Rajapaksa. An English rendering of President Sirisena’s address to the nation explaining the reasons from his side for his actions has been fully reproduced in this chapter. It appears that his main grudge had been against Wickremesinghe and not the United National Party per se. This is a strange development since Sirisena and Wickremesinghe were thick political pals immediately before the Presidential election in January 2015 and in the few months following it. During this period, Sirisena in fact played an accommodating role rather than a dominating one. He took a back seat in the administration of the country allowing Wickremesinghe to have a free go in designing and implementing policy. When the 19th Amendment to the Constitution was before Parliament, there was doubt that it could get the necessary parliamentary majority for safe passage. At that time, he stepped into supporting Wickremesinghe by securing the votes of the UPFA faction in Parliament in its favour. But he always maintained that it was a team effort giving due credit to Wickremesinghe. The battle between Sirisena and Wickremesinghe is continuing to the dismay of the all civic minded citizens of the country. The public display of the conflict between the two heads of state is not salutary for the future of the country. No nation can progress if the two leaders seek to drag the country in the opposite direction. But the two leaders behave as if they are totally oblivious of the damage they are causing the country. 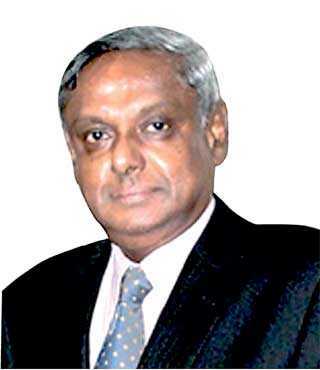 It is on record that he even went to extent of dissolving Parliament hours before a report on a COPE inquiry into the infamous bond scam in the Central Bank suspected to be embarrassingly implicating Wickremesinghe was to be released. Before the Parliamentary Elections of August 2015, when Rajapaksa was closing on the ruling UNP, he directly supported Wickremesinghe by publicly announcing that even if Rajapaksa got majority in Parliament, he would not appoint him as the Prime Minister. That was the type of political cohabitation which Sirisena and Wickremesinghe had in this initial period. Hence, it is interesting to identify how this derangement occurred between them after the elections. Sirisena has attributed two reasons for the breakup with Wickremesinghe. One is the cover-up of the infamous central bank bond scam by Wickremesinghe despite the many warnings given by him as the Head of the State. The other is the purported inaction by Wickremesinghe administration regarding an alleged coup attempt at the life of Sirisena and that of Gotabaya Rajapaksa, brother of the former President Mahinda Rajapaksa. According to Sirisena when the coup details were revealed, instead of taking prompt action, the government led by Wickremesinghe had just sat on it pretending that it was a fake story. Sirisena is of the opinion that this was a serious dereliction of duty given the seriousness of the complaint made. While there is evidence to suggest that Sirisena is justified in his assertion regarding the first charge, the second one is yet to be proved. However, the complaint against the life of the President may be a fake as was held by UNP. Yet, it is the duty of the Wickremesinghe government to present the true facts to the people after conducting a proper inquiry into the complaint. In this respect, the Wickremesinghe government had failed. In the case of the infamous bond scam, Sirisena had given enough warnings to Wickremesinghe. When the story was out immediately after the first scam on 27 February 2015, Sirisena who was abroad at that time had instructed his Secretary to take action to appoint a Commission of Inquiry into it. But, it is felt by the public that this was thwarted by Wickremesinghe by appointing an administrative committee of three lawyers from the inner circles of UNP. Though the committee had given a clean certificate to the Governor Arjuna Mahendran, it had recommended that the scam should be properly investigated since there had been an irregularity in the issue of bonds on that occasion. This was not attended to by the Wickremesinghe government. Then, before the elections in August 2015, Sirisena came on TV and said that he had advised Wickremesinghe to remove Mahendran and have his name cleared. This too was not adhered to. Finally, a special presidential commission was appointed by Sirisena to inquire into alleged bond scams from February 2015 to April 2016. The Commission, while reporting that there had been bond scams, did not find evidence against Wickremesinghe. However, it had recommended action against Arjuna Mahendran and the primary dealer in question. While the top leaders in the primary dealer in question have been taken to courts on a complaint made by the Central Bank, no action has been taken to apprehend the former Governor of the Central Bank. Any action on the recommendation of the Bond Commission is yet to be initiated. This was the grievance which Sirisena had against Wickremesinghe with respect to bond scams. However, the question is whether they were sufficiently justifiable reasons to sack a Prime Minister without going through the provisions of the Constitution and place the country at risk with respect to the economy, politics, good governance and international reputation. This is what Fernando has tried to answer in the rest of the book on the 52 day saga. He has documented in minute detail the events that took place during this dark period of the country. Sirisena was supported in his action by the members of the new political party, Sri Lanka Podujana Peramuna or SLPP, Sri Lanka Freedom Party or SLFP, the minor political parties representing the left and a few civil society leaders. Wickremesinghe was supported by UNP, all other constituent parties in the United National Front or UNF, Janatha Vimukthi Peramuna or JVP and the Tamil National Alliance or TNA. Hence, Wickremesinghe had the Parliamentary Majority whereas Rajapaksa had to still gain it. There were reports that several of the MPs belonging to this group had been coaxed to join the Rajapaksa camp on the offer of numerous gratifications. Despite these moves, Wickremesinghe managed to keep them united under his leadership and that was the main strength which he showed throughout the saga. When the matter could not be resolved through Parliament, it was brought before the country’s highest level of judiciary, namely, the Court of Appeal and the Supreme Court. Fernando has reproduced the judgment of the Supreme Court in full so that any interested reader could make his own conclusion about the constitutionality of the action taken by President Sirisena on the dissolution of Parliament and setting dates for a new general election. The Supreme Court had found that the President has no powers to dissolve Parliament under the 19th Amendment to the Constitution of which he himself was an architect before the expiry of a four and a half year period from the date of the election. Hence, the dissolution of Parliament was unconstitutional and the status quo prior to 26 October 2018 was restored. It compelled Sirisena to reappoint Wickremesinghe as the Prime Minister and swear in a Cabinet of Ministers according to his recommendation. That saw the end of the first phase of the 52 day political saga in Sri Lanka. However, though Fernando has not touched upon it, the saga is not yet over. The battle between Sirisena and Wickremesinghe is continuing to the dismay of the all civic minded citizens of the country. The public display of the conflict between the two heads of state is not salutary for the future of the country. No nation can progress if the two leaders seek to drag the country in the opposite direction. But, the two leaders behave as if they are totally oblivious of the damage they are causing to the country. Fernando should be commended for bringing this story in book form for the benefit of all those interested in knowing what happened during this dark period in Sri Lanka’s history. His reader-friendly writing style has made the book more valuable. The only weakness I observe is that he has chosen to use the respectful address ‘Hon’ in front of all the key players in the saga. In a book like this, the tradition has been to call them by their name and it is not a show of disrespect to them. The wise do not get offended if they are addressed by their name.